Join the discussion on our forums! Come discuss Desperate Resistance over in our dedicated Desperate Resistance discussion topic. On one hand, I'll defend this card for being a worse Ancestral Spirit since Ancestral Spirit would be bonkers in Paladin due to it's sheer amount of good Divine shield minions (ahem Tirion), but on the other hand, the minions you want target with Desperate Stand either already have psuedo-Taunt or just Taunt, so they have no choice but to proc your Redemption off of those minions anyways. Not to mention transform effects counter this card even harder. At least you still get a 1/1 sheep after your opponent pings it off. Transform or silence just completely nullifies this card. 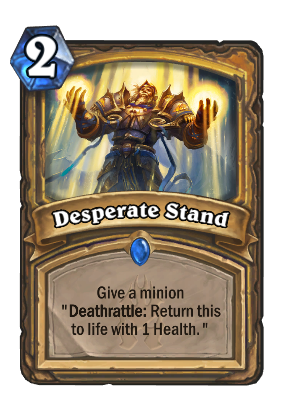 The only advantage Desperate Stand has over Redemption is that you secure the minion you want to resurrect, so you won't get punished by accidentally summoning a recruit. When I first saw this card I thought it was going to be amazing, who doesnt want more tirions. But in reality, if Ancestral Spirit was never game-breaking, this never will be either. I also think that N'Zoth shaman is better than N'Zoth pally, so I rate this card as meh. It will see play if control is strong, but will never be metabreaking. Redemption that plays around Skulking Geist. Everyone keep saying "worse Ancestral Spirit", but similar cards have very different power levels when put in another class, Ancestral Spirit in Paladin would be way better, because their minions are usually stonger and harder to remove. Darkbomb was a strictly worse Frostbolt but still was a 2x autoinclude in every control Warlock. 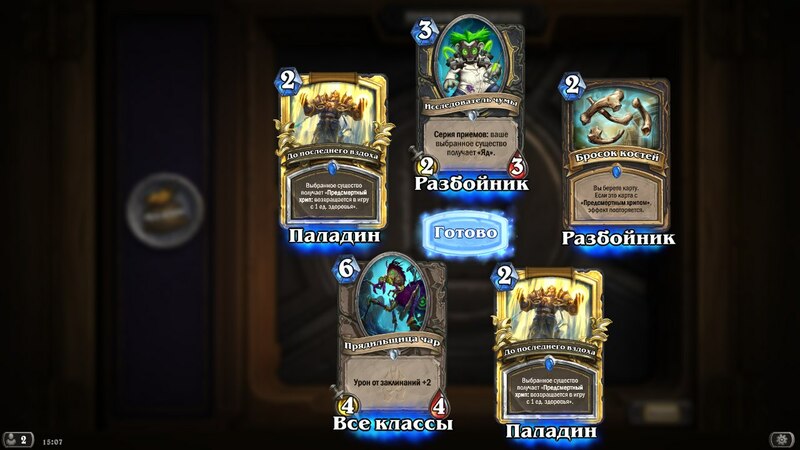 It may not be that good but atleast it's a low cost spell for The Last Kaleidosaur. it is clearly meant to go in a divine shield deck, and maybe a deathrattle synergy as well, so i can be resummoned by n'zoth. What if Redemption wasn't so secret? IS THAT A MOTHERFUCKIN' JOJO REFERENCE!!!??? What about using this on your deathrattles to prep up your nzoth? 2x instant tirion (at the very least) seems like a win to me. Maybe I should also craft cairne. It's pretty meh. Great in conjunction with Tirion. But that's about it. Redemption (which isn't even played except via Hydrologist) is simply better as it makes your opponent's next turn awkward trying to play around Noble Sac, Redemption, and Repentance in a way this spell doesn't. Redemption is far worse because you dont get to choose wich minion do you ressurrect, instead your opponent does. The problem with redemption is that if you want to ress a specific minion it has to be the only one on your side of your board and even then your opponent is not always forced to play into it. Now, guaranteeing this effect on a powerfull minion like Tyrion (that would also synergize with N'zoth) its something interesting. Im not saying this will be a card that will fit in the meta, but its certanly better than the secret version. This set is FULL of Reverse-Powercreep.